By Isabelle Evans | March 6, 2017. 72 year-old John and his horse, Billy. In light of the recent viral video “No Plan” which depicts the positive side of life in south inner city Dublin, we went on a search to find even more out about the area it depicts. One person in particular who stood out for bringing radiance to the Liberties with his involvement in the stables on Molyneux Lane (otherwise known as Keeler’s Stables) was John Behan. 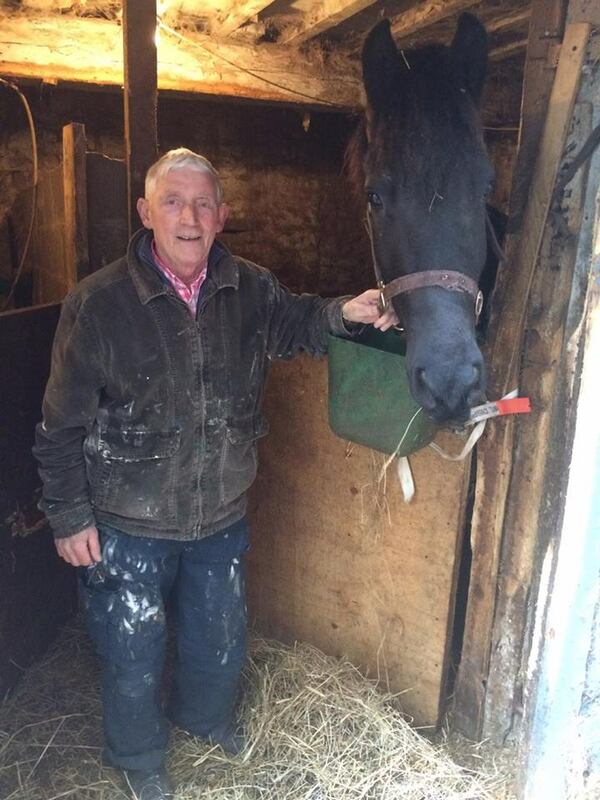 Seventy-two year old John began working here four years ago when his passion for horses led him to one of Dublin inner-city’s oldest and world-renowned stables. John happily welcomed us in, excusing the dusty state of the stables.But we soon discovered that the dust and cobwebs hid a deep rooted history that goes back more than 100 years. Although John couldn’t recall the founder’s name, he was able to show us the abundance of photos that hung proudly on the stable walls. A laminated photo of the founder, a regal ex-soldier on a proud horse, hung proudly next to a framed picture of Bob Marley. Although John has only worked in the stables for a few years, his passion and love for horses came from a young age, and he has owned and trained horses for the past sixty years. His one and only horse, Billy, who is nearly seven, was reared by John from when he was only a foal. He stands over seven foot tall, with a thick luscious brown mane that is complimented by his thick white and brown well groomed coat. “Everyday I come down and clean the stables, give them a feed and groom them. Look at him he has gorgeous coat under that blanket!” Although life in the stables “can be quiet” and relatively inexpensive, it’s a hobby that requires passion and dedication. John visits the stables every morning at eight until the afternoon. “I’d rather have Billy than go to the pub.” he said laughing. “[The horses are] my first thought in the morning and the last thought before I go to sleep”. The stables are world famous and attract international visitors from America to see exactly how these horses are trained. John has had many offers from eagle-eyed foreign buyers trying to buy Billy for up to €25,000. However John had a simple yet polite reason to decline that offer.